Criterion’s recent Blu-ray release of Andrei Tarkovsky’s Solaris (1972) spurred me to watch the film again for the first time in almost a decade. I originally saw Solaris in London in 1975, my initial experience of Tarkovsky, and while I now recognize that it’s not his best work, I was enthralled. I’ve always liked films which draw me in and immerse me in a world of their director’s creating and Tarkovsky’s style is exemplary in that regard. 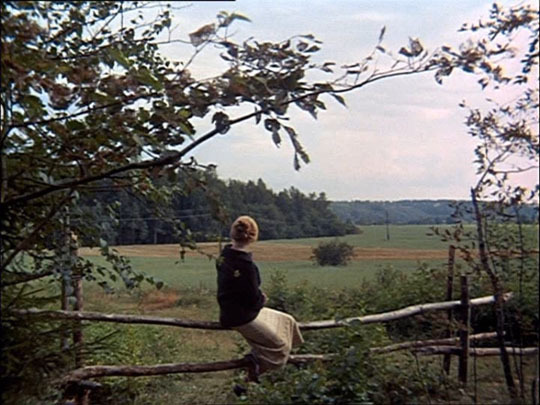 The deliberate pacing, the long takes and elegant camera moves which explore the physical space of his films; the choreography of camera and actors; the use of sound and music … all establish a psychological and emotional environment in which the viewer can become submerged and open up to the aesthetic and emotional flow of the film. Probably what struck me most forcefully on that first viewing (hardly an original insight, I admit) was that it was interesting that the Soviet “answer” to Kubrick’s 2001: A Space Odyssey was a richly humanistic meditation on the psychological and spiritual experience of being human, while Kubrick’s movie of course is virtually devoid of a psychological dimension, a chilly technological fable in which human beings are affectless pawns of cosmic forces. I didn’t encounter Tarkovsky again for more than five years; on December 5, 1980, I saw his historical epic Andrei Rublev (1966) at Studio One, an excellent film club in Hong Kong. After the almost claustrophobic intimacy of Solaris, the sheer scale of Rublev inspired a sense of awe. Here was possibly the greatest of all historical epics, the first film I’d seen which actually felt as if it had been shot in the medieval world by a filmmaker with a remarkable documentary eye and a passionate empathy for the people living in those harsh times. But once you acclimatize to the incredible scale of Rublev, you realize that this too is an intensely intimate examination of what makes us human, of the emotional and spiritual responses of small individuals to the overwhelming harshness of life in a pitiless world. In retrospect, Rublev helped to throw light on the meanings of Solaris; for Tarkovsky, some sense of the spiritual, a consciousness which transcends the crushing limitations of the physical world, is what makes life bearable. Now, I’m not in the least a religious person, but the power and conviction of Tarkovsky’s vision is something I respond to intensely. I think this is because there is nothing dry or cloying in his spirituality; the difficulty of human life is offset in his films by an equally powerful love of the natural world and it becomes apparent that the harshness of life arises not from the conditions of that natural world but rather from the limitations of human beings who fail to see or understand the beauty that surrounds them. The cruelties of life in Tarkovsky’s films arise from human behaviour. It could easily be said that his view is naive, that offering a spiritual response to social and political problems can lead to no practical solutions; that mystics can be criticized for separating themselves from the problems of the world rather than engaging with them … but the counter-argument is obviously that the purpose of mystics is simply to illuminate another way of looking at the world, that it’s up to everyone else to act on their vision. 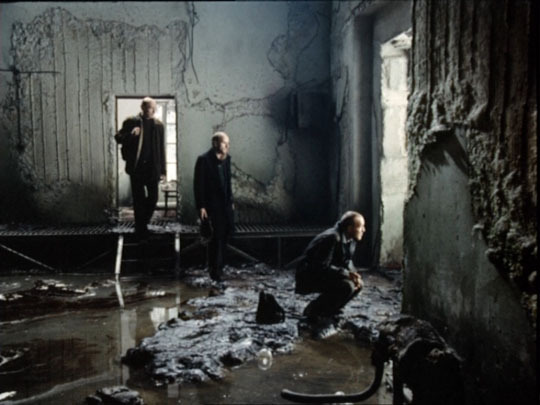 It was on January 15, 1981, also at Studio One in Hong Kong, that I saw what I consider to be Tarkovsky’s greatest film, Stalker (1979); I went to see it again on April 22 when Studio One brought it back because of members’ intense responses (some absolutely hated it, others felt like me that it was a masterpiece). Based on the science fiction novel Roadside Picnic by Boris and Arakady Strugatsky, Stalker depicts the operation of hope, faith and despair in three characters who make their way through a wasteland towards a room which legend has it contains the power to realize one’s innermost desire. 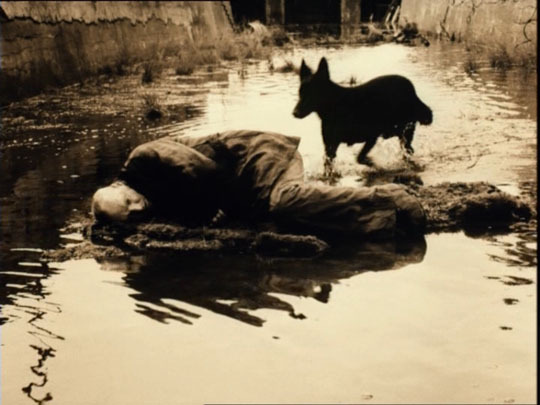 It’s not difficult to see why Tarkovsky had problems with the Soviet authorities; coming after his “obscure” and “personal” Mirror (1975), Stalker can be seen as an allegory about the forced suppression of spirituality by the communist dictatorship. 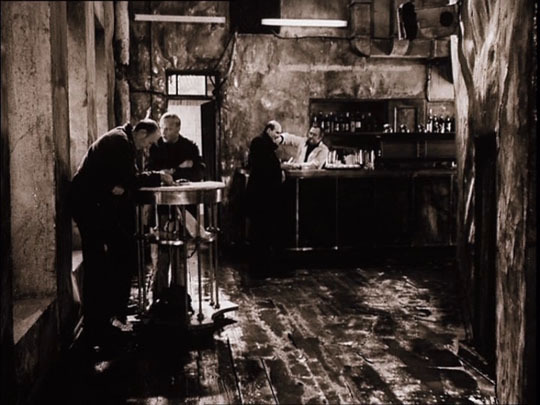 In the film, there is a forbidden Zone where some cosmic event has apparently disrupted space and time, at the centre of which is the Room where wishes are granted. The Stalker, an illegal guide, leads the cynical Writer and the rational Scientist into the Zone, breaking through a militarized cordon set up to prevent access to something which could potentially undermine political authority. The bulk of the film consists of the journey on foot through a lush, overgrown wasteland during which the characters discuss life, politics, art and religion. It turns out that the Writer is an alcoholic because he can find nothing to believe in; that the Scientist is carrying a bomb to destroy the Room because its mere existence threatens the rational functioning of the state; and that the Stalker, despite his many trips to the Room, has never himself ventured inside because what keeps him going is the possibility of some transcendent meaning (in other words, faith), a possibility which would be ended equally by its fulfillment or its failure. What makes life bearable in an oppressive world (and the world outside the Zone is powerfully depicted as grim and oppressive) is the idea that there are better things to strive for. While this might seem like a recipe for passive acceptance of the status quo, the final image of the film suggests that a kind of evolutionary change is possible. Three-and-a-half years later, in the summer of 1984, I saw Tarkovsky’s most personal film in London. Mirror (1975) is the greatest film ever made about memories of childhood, a rich, non-linear stream of consciousness about growing up in Stalinist Russia, with intense personal memories weaving in and out of glimpses of history – the Spanish Civil War, World War 2, scientific advances, political passions and oppression. 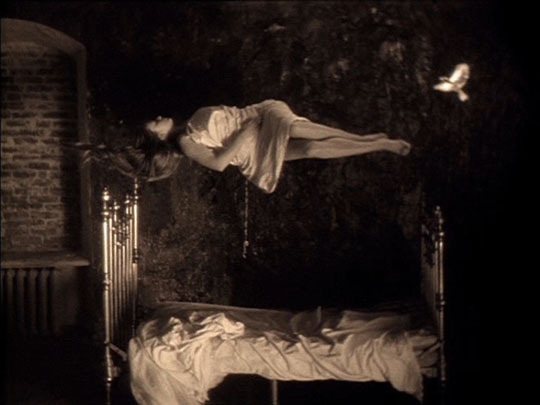 It’s in Mirror that Tarkovsky most fully realizes his aim to create a sense of personal consciousness through the choreography of camera and actors, rhythms of movement and editing. Perhaps more than any other of his films, it took me longer to understand what Tarkovsky was “saying” in Mirror, but that never seemed to matter because every time I saw it, from the opening moment, I was immersed in such a rich, tactile world that the experience of being there was in itself enough. For his final two films, Nostalghia (1983) and The Sacrifice (1986), Tarkovsky went into exile – first to Italy and finally to Sweden. There’s a deeper sense of despair in these two films than in any of the ones which preceded it, a despair rooted in the director’s own displacement. 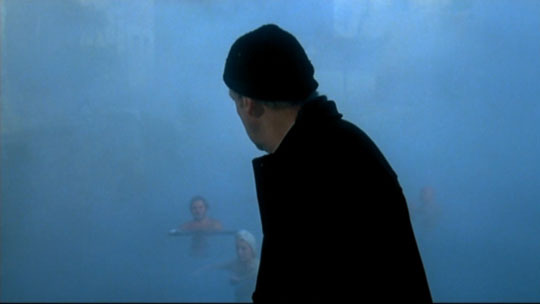 The subject of Nostalghia (which I also saw in London in the summer of 1984) is specifically the state of exile, its narrative focused on a Russian poet travelling in Italy to research the biography of an obscure 19th Century exiled Russian composer; these levels of separation from homeland drive the film towards its final images of self-destruction and death, the gorgeous imagery unable to stave off the overwhelming sense of desolation. In The Sacrifice (which I saw two nights running at Cinema 3 in Winnipeg in 1987), this sense of loss expands to embrace the entire world as the protagonist is driven to self-destructive madness by visions of nuclear holocaust. 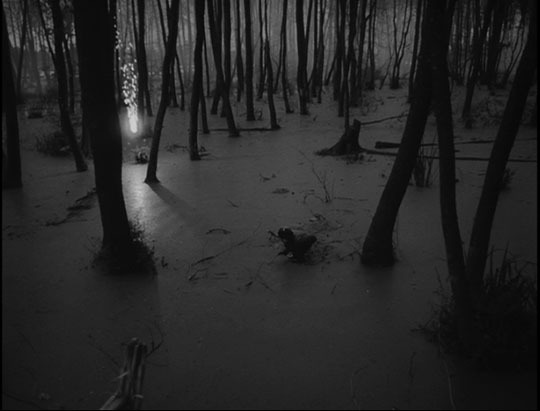 It’s hard to see where Tarkovsky could have gone after this if he hadn’t died just as the film was finished. It was probably around the time that I saw The Sacrifice that I finally got to see Tarkovsky’s first feature, Ivan’s Childhood (1962) – unfortunately on VHS (this remains the only Tarkovsky film I’ve never seen in a theatre, though I’ve since watched it several more times on DVD — a vast improvement!). 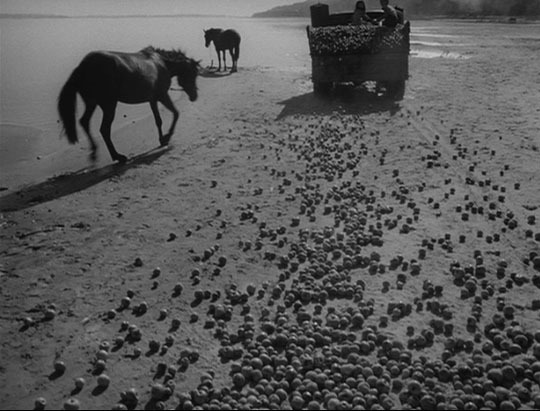 Although this is the one Tarkovsky film which seems firmly rooted in a particular genre (the Soviet Great Patriotic War film – equal to Kalatozov’s The Cranes Are Flying  and Chukhrai’s Ballad of a Soldier ), Tarkovsky’s deeper concerns are already apparent in some of the heightened poetic imagery (the horses eating apples spilled from a truck on the beach; the ethereal birch woods) and the ways in which the characters drift in and out of his elaborate, lengthy tracking shots as if their presence in an enduring world is fragile and transient. A sense of impermanence and loss is palpable in this story of a young boy caught up in the war. And that sense is what underlies all of Tarkovsky’s work, including Solaris. His best-known film in the West is ostensibly a science fiction story (based on the classic novel by Polish author Stanislaw Lem) about an encounter with a vast, unknowable alien being (the planet of the title which is apparently a living, sentient entity), but its real subject is the condition of being human, which for Tarkovsky is about love and uncertainty, loss, grief and impermanence. The slow, deliberate pace, the lingering looks, the focus on details and textures of the physical world, create an almost unbearable sense of a world continuously slipping from our grasp. 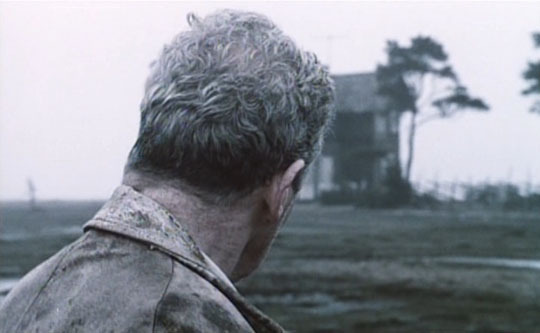 Perhaps more than any other filmmaker, Tarkovsky shoots his characters from behind, glancing uncertainly over their shoulders beyond the borders of the frame, evoking a sense of loss and of being lost, the inability to seize any certain knowledge which might ease their pain. There is unquestionably something heavy and Russian about Tarkovsky’s work, a humourless contemplation of the sheer weight of human existence … but throughout his films, this heaviness is constantly countered by the breathtaking beauty of his imagery, the sense that all that pain and loss can be alleviated if we only open our eyes and take notice of the world we’re passing through. This entry was posted in Commentary and tagged Andrei Tarkovsky, Art Film, Criterion, Directors, Russian Film, Science Fiction. Bookmark the permalink. Your blog (and your personal website as well) is a wonderful resource. These reflections are much appreciated!